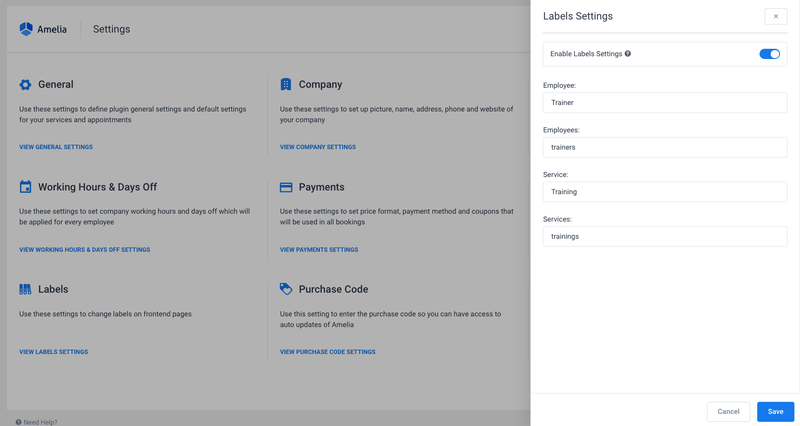 Labels Settings enable you to change the names of the main labels on the front-end so they conform to your business. Once you enter the Labels Settings you will see the option Enable Labels Settings which is enabled by default. This option allows you to change these labels here. As you can see from the picture, if you have a Gym and you need to change the employee/s and service/s labels for some other, you can enter the names you want your clients to see when they are scheduling. After entering the names, click Save, go to the front page, and you will see the new names for those labels. If, on the other hand, you want to translate the plugin using some third party plugins please disable this option so these labels can be translated in the file.